Wow. I forgot how smelly chickens are when they are residing in your living space. The little chicks are getting big quick. And chickens poop. A lot. No really, a lot A LOT. Which is one of the awesome reasons to have them… not only do you get amazing eggs, but you also receive tons of amazing fertilizer. It is only fantastic, however, when they are living outside. When they are in your basement? Not so much. They like to hang out on top of the waterer (and poop). They are learning to fly within the brooder. Roost on top of their food trough (and poop). One flew out when I took the lid off. The first escapee! They peck at the sides when I am filling up their food. Most of them will eat out of my hands. 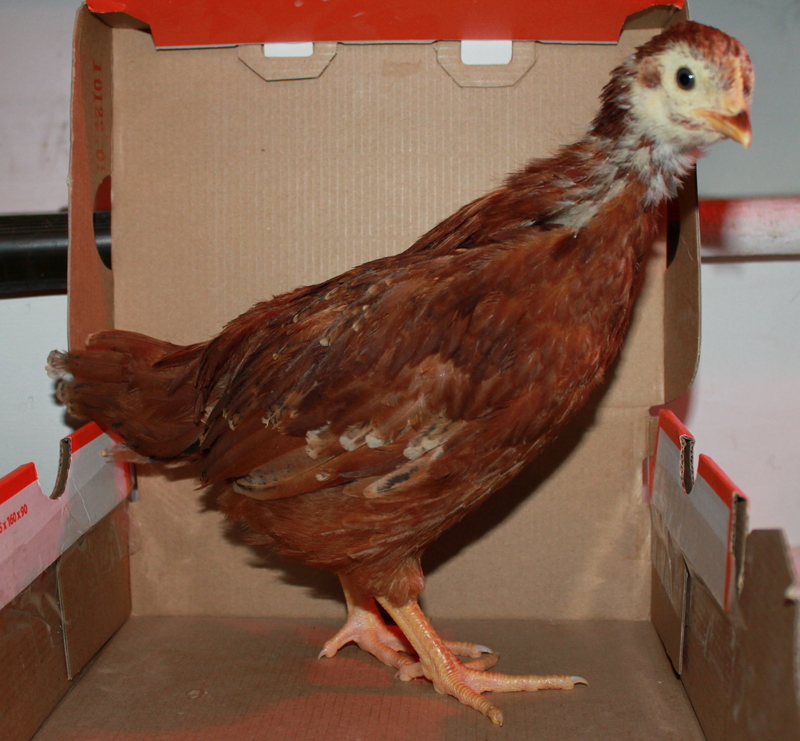 If you want to see how the girls have grown you can check out at about 1 week (including how I set up their brooder), about 2 weeks and about 3½ weeks. 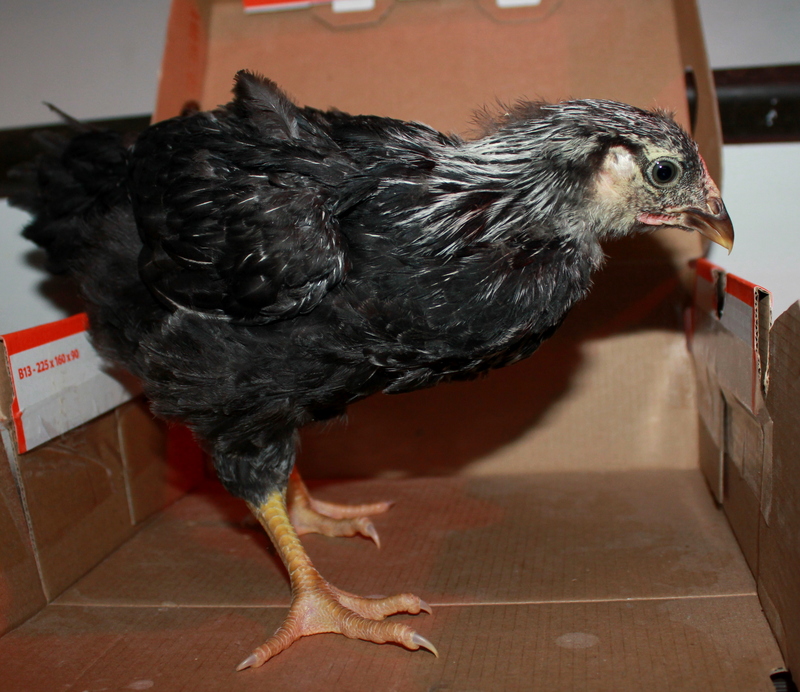 They are about 5½ weeks now (except the older Black Australorp who is about 7½ weeks). Do check back to compare them to now…it is really pretty amazing how quickly they grow and how much they change. Rhode Island Red. She seems really sweet and so far is the easiest to handle. She doesn't seem to mind being picked up and was the first to eat out my hand. Golden Polish, Lady Guitar. Oh my, I love this girl. The polish chickens are so funny. 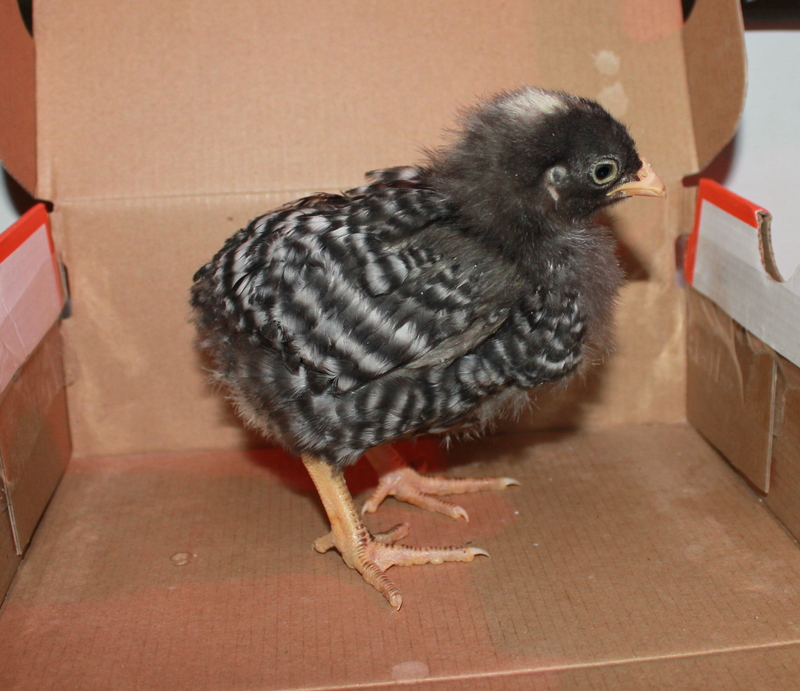 Silver-laced Wyandotte. She seems a bit flightier than the rest and was our first escapee. The larger Barred Rock. That striping is awesome! 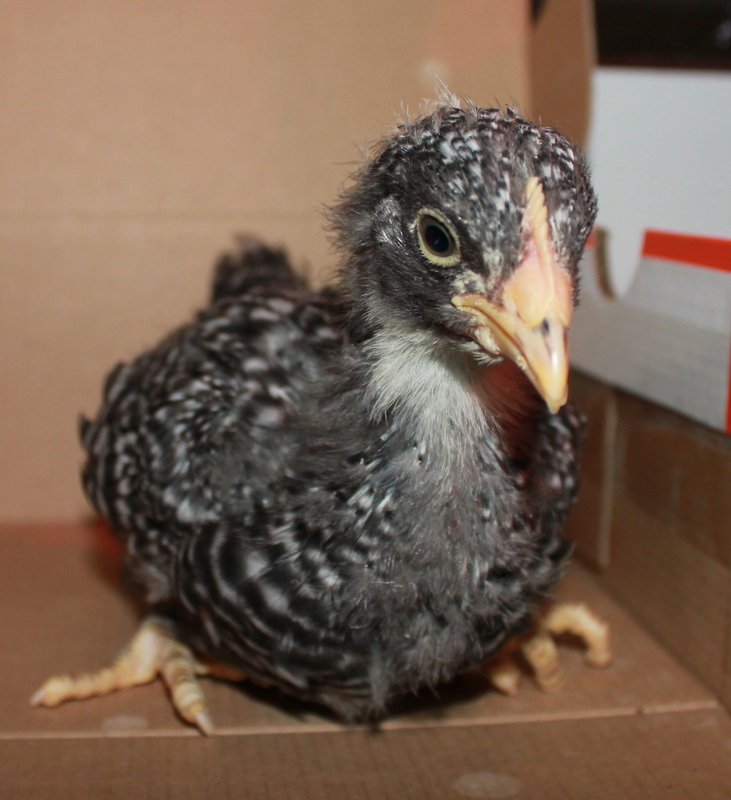 The itsy bitsy Barred Rock. Or is she a Dominque? I'm still a bit unclear. Anyone? She tends to hide a bit which I imagine is because she is so small, but she seems really calm. 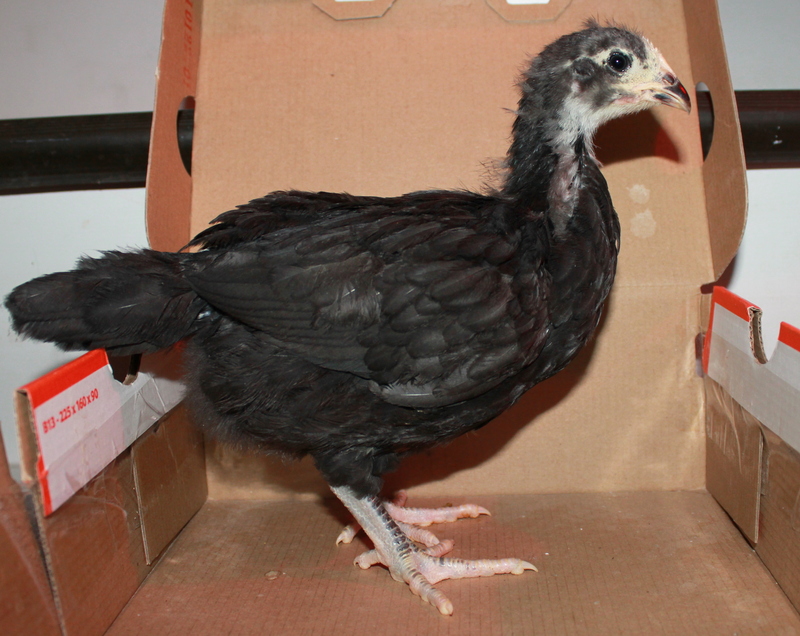 The younger Black Australorp. What is up with that pencil neck? 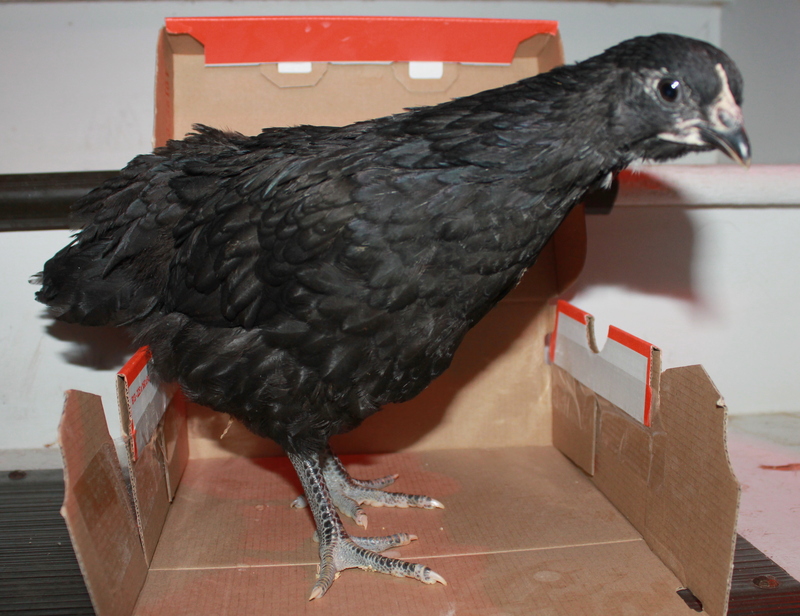 The older Black Australorp. She's huge and ready to go outside but we need to wait for the others. We are pondering Operation Chicken Integration and have received some great tips from the facebook page, Backyard Chickens and the Seattle Farm Co-op (listserv). So thanks everyone! The coop is coming along. We gathered all the necessary wood to expand our current coop to accommodate the new flock. It has rained so much we ended up painting all the pieces in the basement over a few days. We are ready to get it all put together now, cross our fingers and hope for the best! 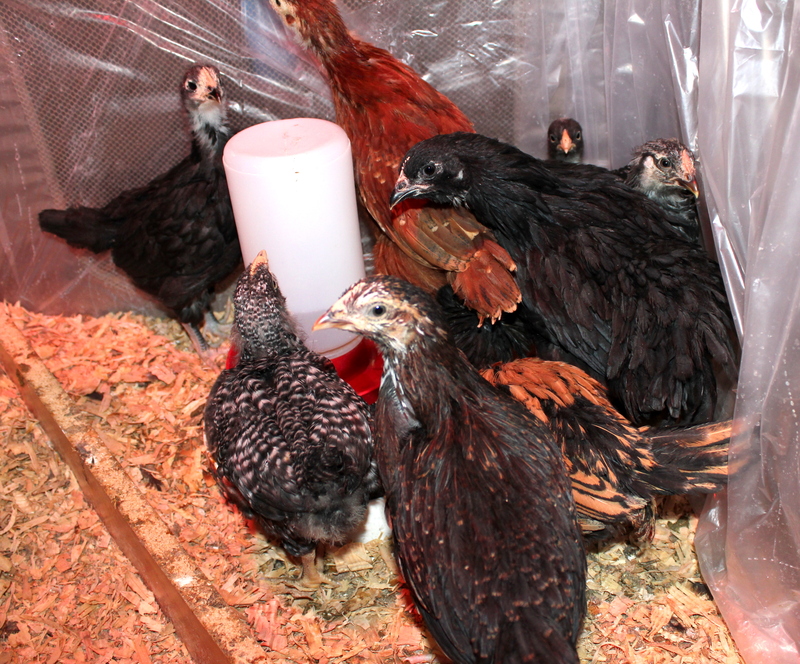 The group of them in their brooder when I come to see what all the ruckus is-- the girls like to party it seems. Funny girl! The bigger Barred Rock striking an odd pose. We should have all our names picked up in the next week or so. We know at least 3 of them! 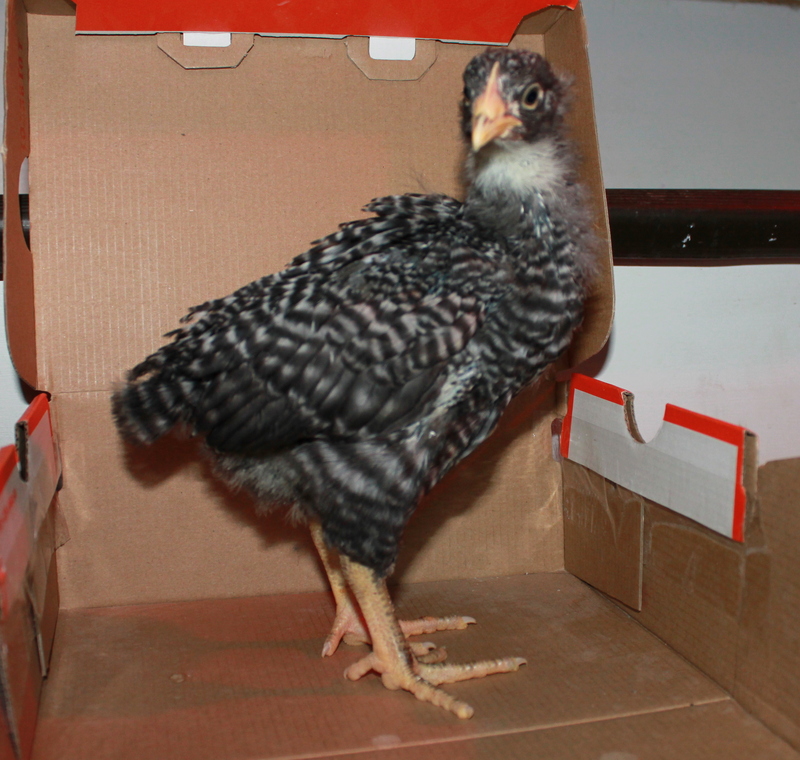 This entry was posted in chickens and tagged barred rock, black australorp, brooder, chicken coop, chickens, golden polish, rhode island red, silver laced wyandotte, speckled sussex. Bookmark the permalink. I can’t wait until they are laying eggs! Yummy! Wow, they ARE getting big! This is where living in a one-room cottage becomes a drawback. No place to contain chicken smell but the bathroom (how appropos). 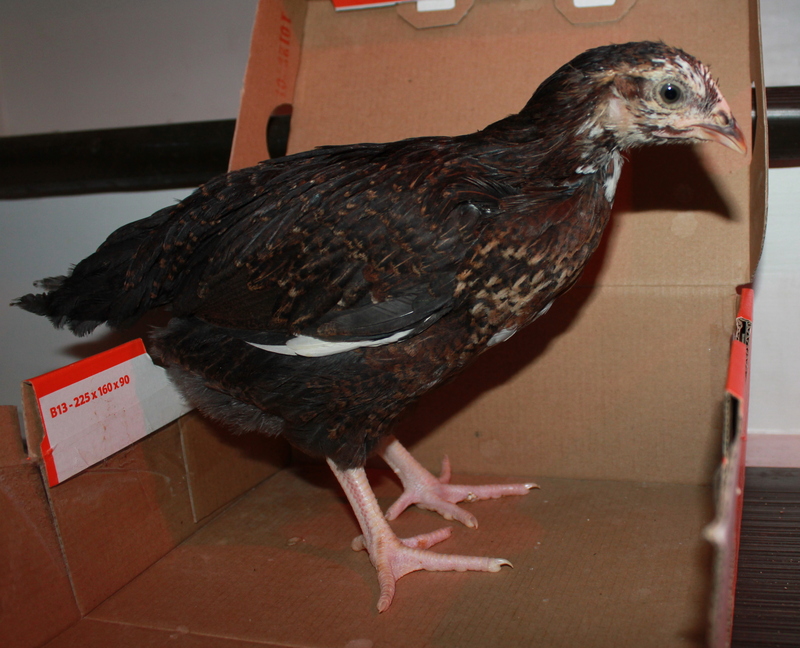 I love the Barred Rock runt. Runts are the best. I hope you’re getting some sleep with all the noise. How soon do they get to move outside? I have a feeling that the one making all the fuss is the one with the Mohawk, amirite? She looks like a troublemaker if I’ve ever seen one. 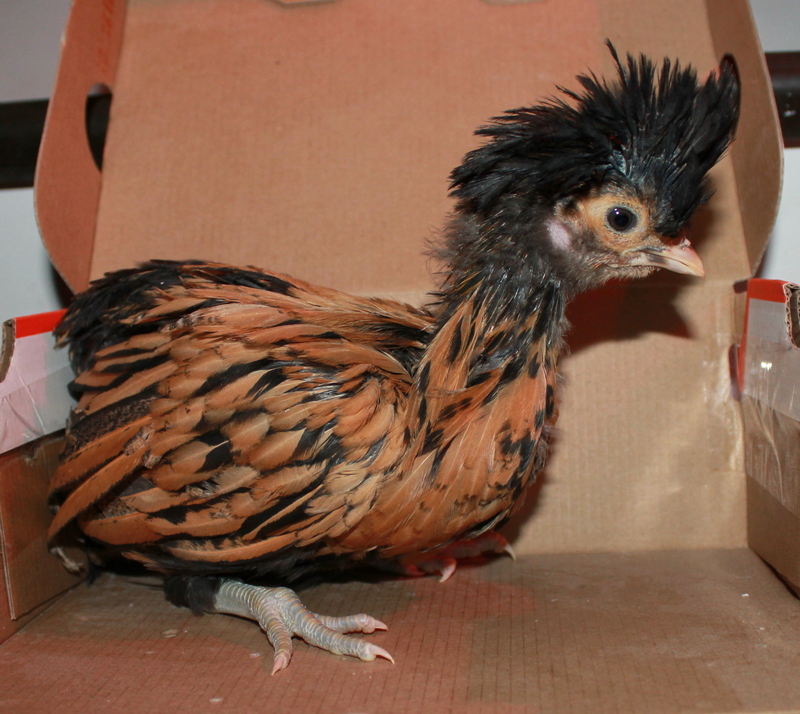 Wish I had some hens with Mohawks in my garden.